Graham Oakes: Me, Interval, then Frankie Boyle. Me, Interval, then Frankie Boyle. The following is a long lost blog post, originally writen on the 18th October 2011. I've done a spot of traveling over the past 2 months. 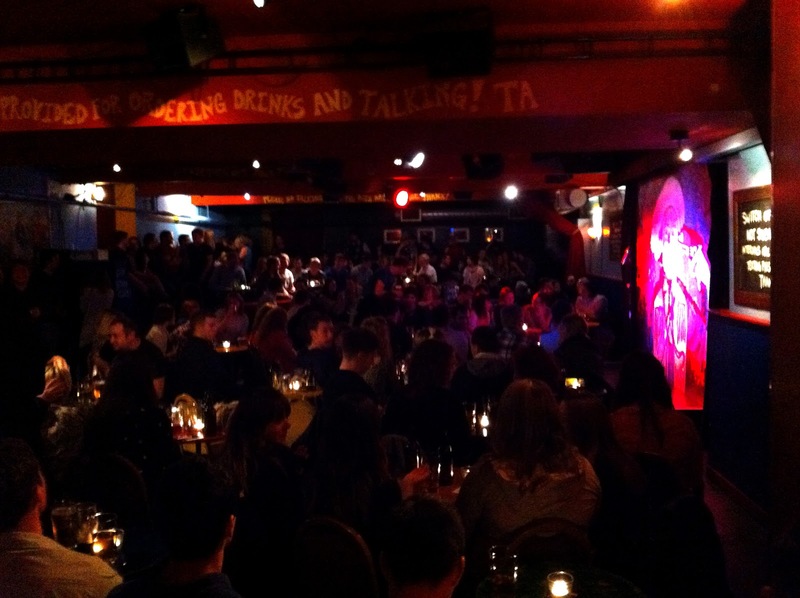 At the start of September I went down to London to perform Downstairs at The Kings Head. It was a great gig with a full room of people up for comedy, but I tell you 2 days worth of traveling is a lot for 5 minutes stage time. Got the coach down and back and stayed in Witham with my friend Chloe (who definitely helped make all the traveling bearable) so between 2 coaches, 2 trains and 3 tube journeys I was traveling over 17 hours in 2 days. The 5 minutes were excellent though. I had booked it about 5 months previous with the aim of doing a gig in London, I came home feeling it was worth it. I have just done 2 nights at The Stand in Scotland, last night in Edinburgh, tonight in Glasgow (writing this on a train from Glasgow to Edinburgh to get the train back to Newcastle at 5:40am, good times). The gigs were amazing, both of them, but Glasgow especially. At a guess I'd say 200 people packed into the room all of them wanting to laugh. My 10 minute set both nights went excellent (only 5 hours on trains over 2 days for 20 minutes stage time, so much better!). To top the night off we had Frankie Boyle closing the Glasgow show, quite a nice surprise! The lineup went me, interval, then Frankie Boyle. Crazy. I've spent the 2 days with Jack Gardner who was also a nice surprise to find in the lineups! We've had quite the epic time hanging out, writing, analysing and performing together the last 2 days. Much like my friend Chloe did in London, even if the gigs were terrible the company would have made it worth it. I should mention again the gigs were amazing, tonight is probably the best room I've played. I have a 4 hour window in Edinburgh to get some sleep, I feel my usual post gig high may hinder this. Work tomorrow could be fun. the correct one and click "Get" and Tutu Helper App also the application will certainly begin to download Here You could easily inspect the download Tutu Helper VIP App progress from the "Manage" switch. If effectiveness is of mixcloud.com/ utmost essential to you, then you will most Official Website definitely more than happy with the Fleck 9100SXT Best Fleck Water Softener design considering that they just regenerate Fleck Water Softener Reviews when needed Every one of the streak Fleck Water Softener water softeners come fully set up. Copyright © 2010 Graham Oakes. Picture Window theme. Powered by Blogger.